Now that our frustrating sofa from The Brick has exited, stage right, I’d like to introduce you to our new sofa. Although the proportions might make it look like a loveseat, it is a sofa. Specifically, it’s the Natuzzi Editions Sassi II Sofa, from Sears. Although this colour/leather grade retails for $1849.99 plus tax (yikes!) we paid only $660 + $40 delivery. How? 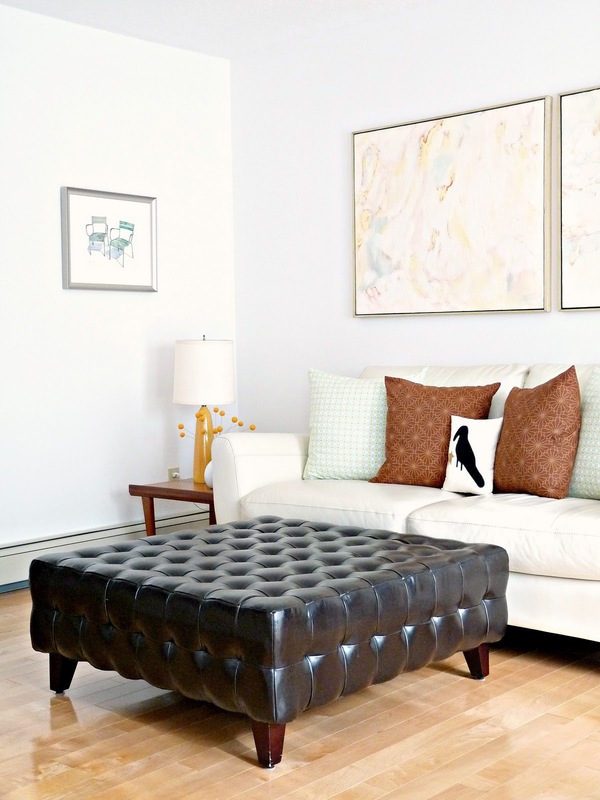 This sofa is a kijiji.ca score! I was trolling the online classifieds (actually looking for new side tables) when I spotted this sofa. I recognized it because my parents have this sofa, and the matching loveseat, in their living room (in a pretty, cinnamon-hued leather). 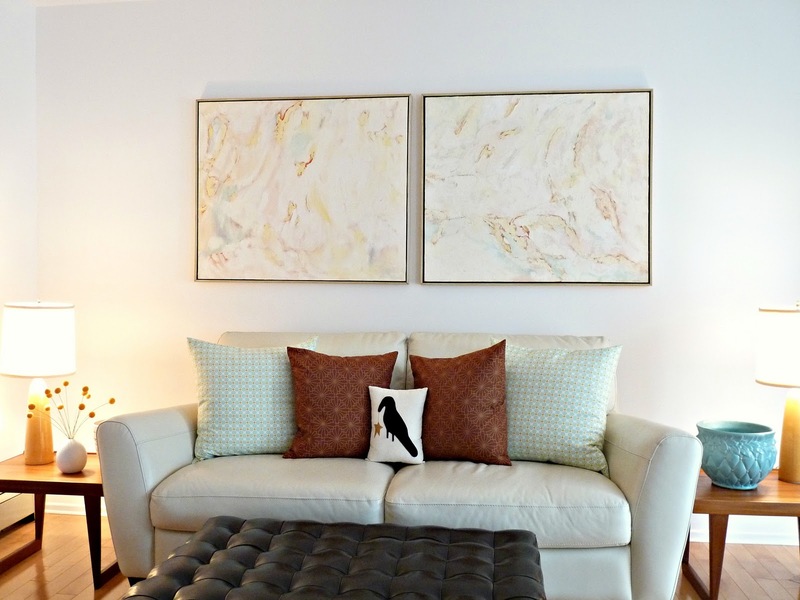 The seller had purchased this sofa in 2009, moved to a larger home and no longer had a use for it. Minus one unfortunate blue spot (behind a cushion) this sofa is in fantastic condition and spotlessly clean. We took some time to think about it to make sure this purchase really was a good idea, but ultimately we went for it! Having decided not to splurge on a new sofa until we settle in a more permanent house, I thought we’d have to suffer the disintegrating sofa until then. This impromptu purchase was a pleasant surprise and we couldn’t be happier. Although we’d never purchased a previously-loved sofa before, you’d never guess it wasn’t brand new. 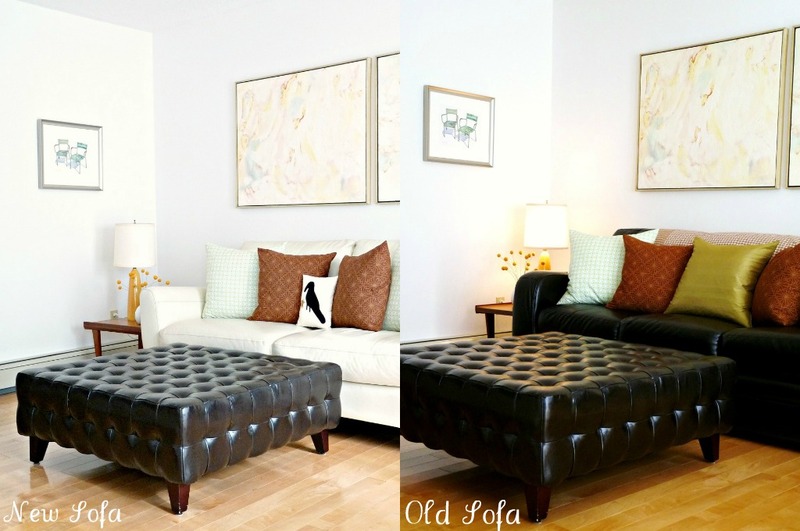 Because it is a touch narrower than our previous sofa, we can turn the side tables sideways! I think the whole effect makes the living room look brighter, warmer, and bigger. We can turn the side tables sideways now! My mom and I are going to sew a new throw cushion that ties in the dark ottoman and cream sofa. (UPDATE: see the perfect pillow mix here). Fancy sofas have fancy little metal tags advertising the brand. Oooooo. 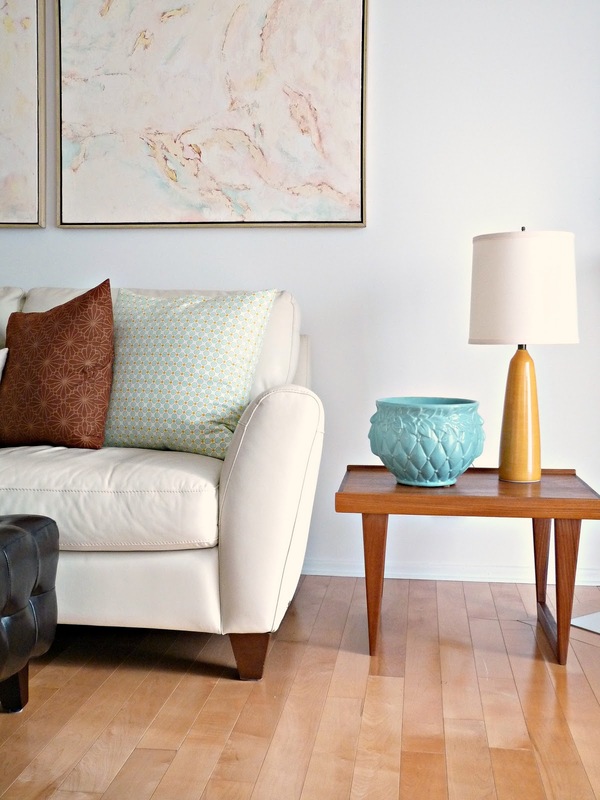 of all the things in this room, my favorites are the lamp and the vase. they make the room so pretty. such wonderful touches to a beautiful 'new' room. Thanks ladies!The lamps are vintage Lotte lamps with new shades, the black-specked planter is vintage (scooped from my grandma's mantle) and the side tables are teak, scored for $20 at an estate sale. Not the exact period I like (a bit more 70s for my liking) but good enough for $20! It's amazing how changing one thing completely changes the room. I loved the dark sofa, but I love this one too. It definitely makes it a brighter room, but still soft and relaxing. What a huge difference. 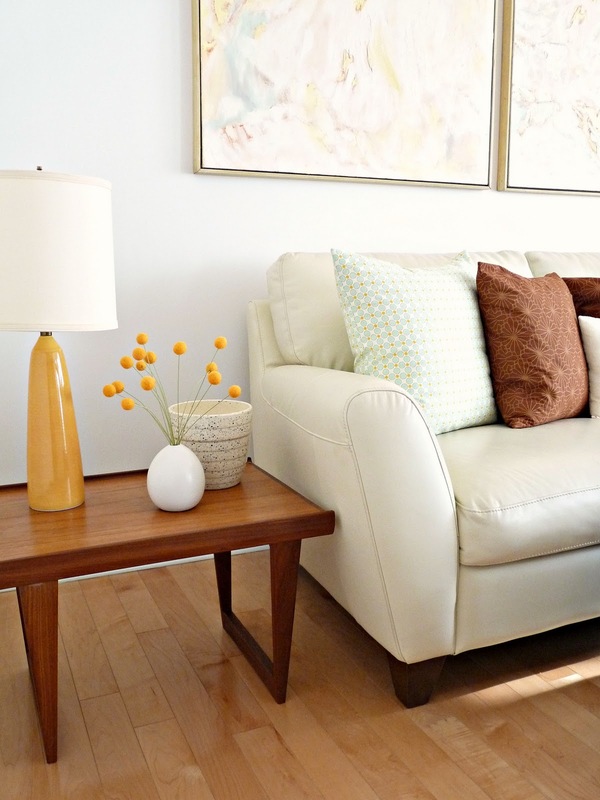 I have an almost identical sofa and I love the white leather. Your tables are gorgeous so I'm glad you can show them off a bit more. I love your new sofa! I absolutely love white leather, it's so beautiful. And I'm obsessed with your side tables. So glad you get to show them off now! The room looks great! Love the new sofa, and I can't wait to see what you and your mom have planned this time. It totally brightens up the space! 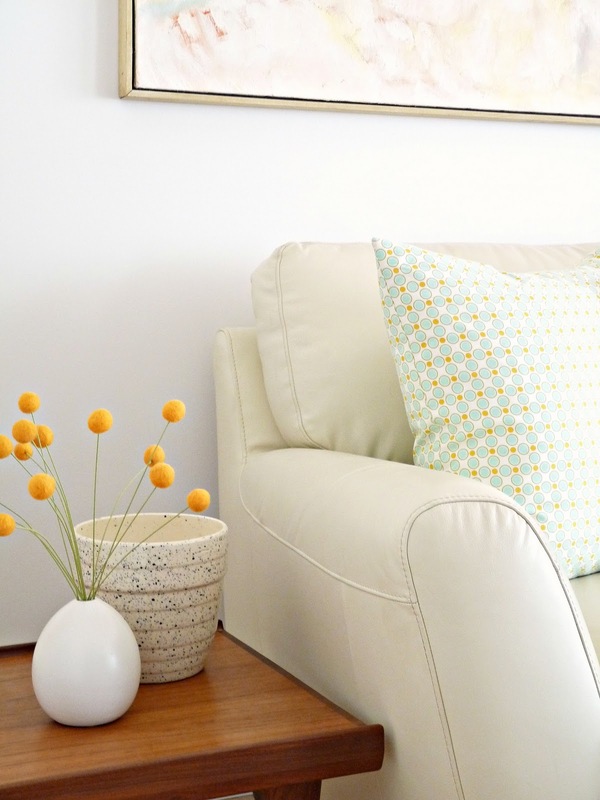 I also really love the little yellow flowers next to the sofa and your beautiful throw cushions! Great find! The new sofa is a great addition!! 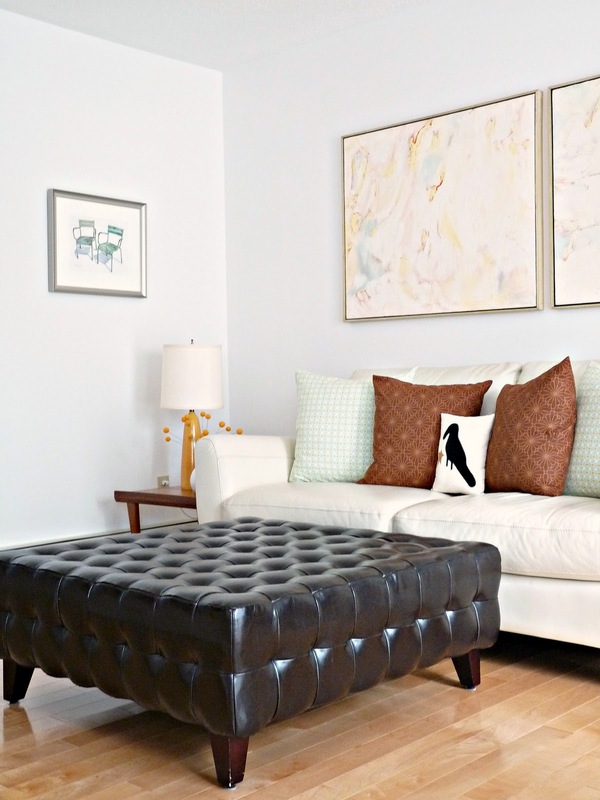 I love the contrast between it and the ottoman! And, I have to say that your pics are lovely!! I'm adding to the love of the new sofa, everyone [um, including you:)] is right on in their assessments of awesome-ness. Congrats! Wow! The new sofa's changed the whole living room. 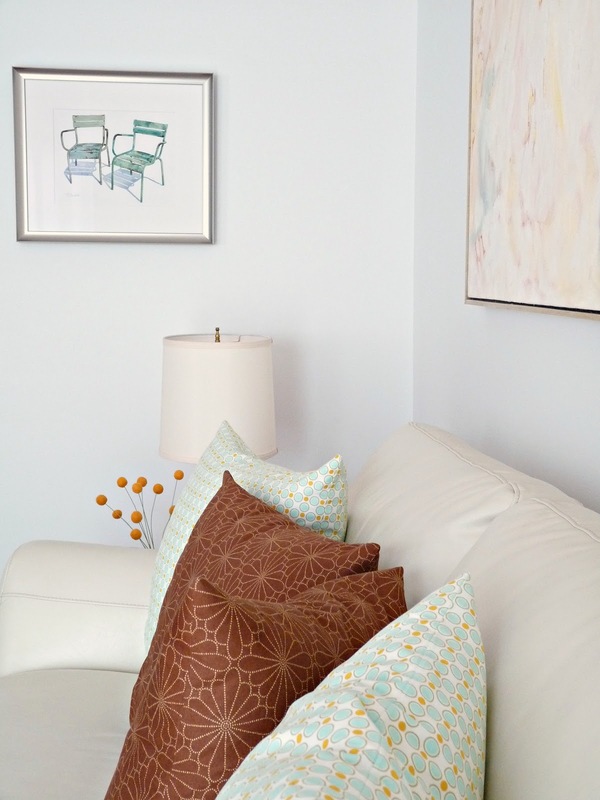 I've always liked furniture in bright colors beacause of its airy feel. Thank you for a good hint by stating kijiji.ca. What a score! Your surely know where to find gorgeous home pieces, Tanya. Overall, the living room looks great. All the details complement the space. 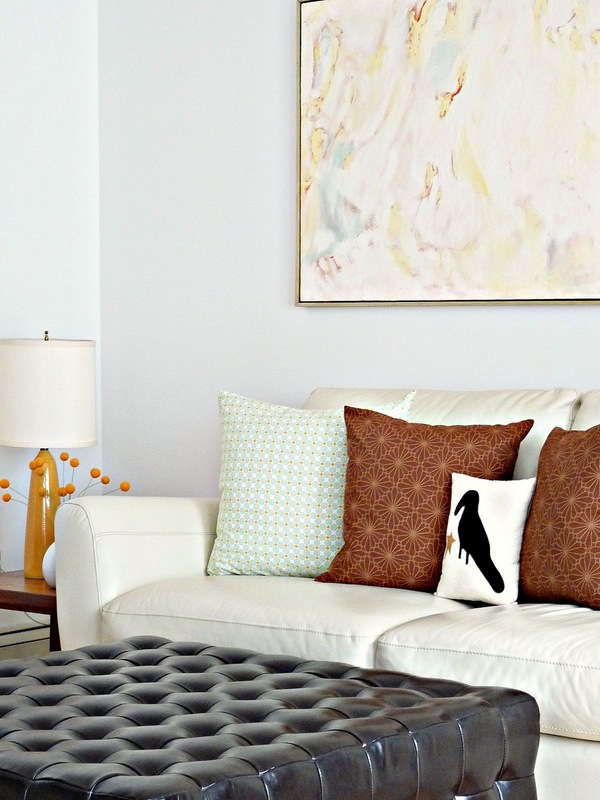 Even the cushions add some character to your living room.